One thing I noticed (compared to modern games) with Adventure and now also Zork is that it is enjoyable to explore a wide open space; the feeling of world-immersion is strong even when many of the room descriptions are unassuming. [..] Modern adventures and interactive fiction tend to a tight room-structure, where no space is “wasted”. Yeah, this is interesting. There are I think a couple trends going on here. One is the trend towards extended room descriptions and detailed scenery (I note how simple and “navigational” the room description you quote is). I think this probably makes it more expensive to add a new room, since you have to come up with all this extra text. Another is the trend towards tightness for the sake of tightness — like, the idea that rooms and items should have multiple uses in the game, not just one. It’s probably a fair point that that creates a certain sort of feel that isn’t always appropriate for a game, though. Sometimes I’ve spent time trying to create the feeling of traveling a long distance by writing an appropriate message when you go in that direction, but maybe a better way to do it would be to just create multiple rooms, even if they don’t have any role except to make it feel longer. I have another present for you. I spent many hours organizing the original Zork map. You can check it out here: http://textfyre.com/DungeonMap.pdf. I used Microsoft Visio and did it all by hand. Enjoy! I just took a peek (I didn’t want to look too closely, I want to avoid spoilers) and it looks fabulous, wow! I’m trying to play zdungeon and the thief is not acting as I recall he should. Not to get spoilery, but I recall this puzzle being much simpler. I did get Confusion working so I’m using that in my main game, but I am poking at ZDungeon for puzzles still due to unlimited save games. I do remember Zork I well enough that some parts will give me no trouble, but my Zork II and Zork III are quite foggy. FWIW, I believe that much of Zork II was new rather than lifted from the original Zork / Dungeon, and that Zork III was wholly or almost wholly original. I’m starting to get that impression. The usual history remark that the mainframe version was too big so it was split into three games seems a bit off. And now that I think more about it, I believe that parts of the original Zork also ended up in Sorcerer of all places. A game that I thought did a great job of giving a sense of space without creating too many rooms was A New Life; there are some points where it prints several (short) traveling messages separated by space presses, so it actually takes some time and action to travel, but you don’t wind up looking for things to do in the space-filling locations. I haven’t started puzzle-solving in earnest but it does seem like it will be a drag. Oddly enough, I think Adventure with the magic words making it possible to zip across the map handle the large space a little better. 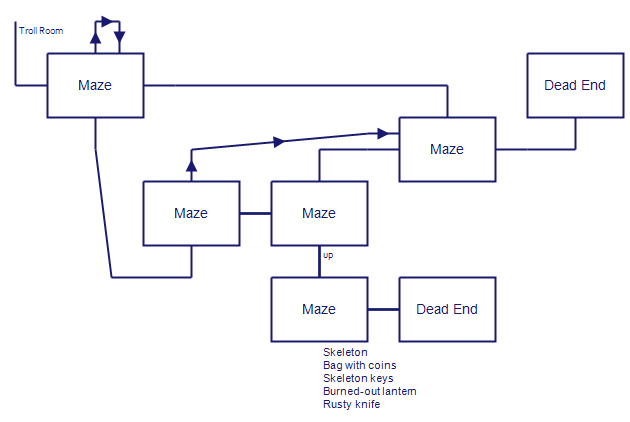 There’s at least one map-zipping in Zork but it seems to be more puzzle related than navigation-help related. If you don’t like taking notes I definitely see why the game wouldn’t agree with you. I played Adventure and Dungeon with a guy that scoffed at taking notes, but his theory was that if you couldn’t keep all of the information in your head, you were somehow diminished as a player. Of course I think he went on to work in Naval Intelligence so I think his capabilities were abnormal. On a side note, if someone feels inclined and has access to a 64 bit FORTRAN compiler, the ifarchive has several instances of dungeon that could use a recompile. None of them work on Windows 7 64bit. I don’t think we need 64-bit builds of Dungeon on the Archive! Using a 32-bit compiler like G77 to generate Windows 32-bit executables should be fine – the existing builds won’t work on Windows 7 64-bit because they’re all using DJGPP’s DOS32 mode or similar, but a Win32 console build will work. There are also a vast number of red herring locations (and even whole time zones) that you don’t need to visit at all, making the game last even longer if you’re not sure of what locations need to be visited. I’ve been intrigued by reviews of Time Zone. This all makes me feel I shouldn’t bother. Should I? If you want to “experience” it, boot it up on an emulator and wander around lost for a while. If you want to “play” it, get a list of what order you should visit the time periods. Go by that. For this, I’ll be using the Z-dungeon game too – it’s just easier to get working on a modern-day computer. 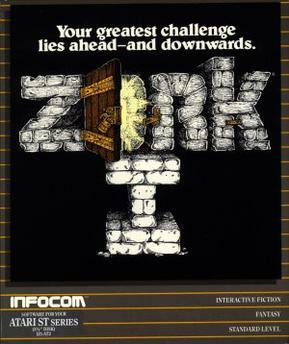 I’ve played Zorks I-III recently, and remember many solutions – I’ve also played this game a while back. I think it’s basically Zork I + about half of Zork II + the endgame and Royal Puzzle of Zork III + some stuff that wasn’t in any of the Zork trilogy. The circular room is, I think, in Zork II.